Food costs are going up too. In fact, they’re up 25% in the last 5 years. And with a healthy economy, they are not likely to go down this year. And rent? Well, nobody’s getting a subsidy on that. To make it even more painful, there’s a changing mood around fine and casual dining. Seems the spenders – the millennials – want something smarter and trendier. And that’s not an easy recipe. As you already know, the industry is a single digit margin business – and that’s for successful restaurants. So how can you fulfill that New Year’s dream? At Orderly, we work with hundreds of restaurants every month to solve this problem. We’re here to share 3 of the best ideas – proven ideas – that you can use to run a more profitable restaurant this year. Your business has two main health measures: COGS and food cost. The problem is that not enough restaurants know them or manage them weekly. First, get an accurate weekly Cost of Goods Sold. Once you have your COGS, calculate your Food Spend percentage. This is your COGS divided by your Sales. You are shooting for somewhere in the 30% range. Now that you have these numbers… Manage them weekly. If your COGS goes up and it’s not in proportion to sales… Houston, we have a problem. BUT, if your COGS stays flat or goes down and sales go up… Yeah, baby! That’s what we’re talking about. The point is, know your spend and how it relates to sales more than once a month… Manage them weekly. It will help you order more efficiently – and yes – make more money. You’re now completely focused on food spend relative to sales. We’ve all done the dirty… you know, the dirty work of finding our recipe plate cost on every menu item. But when we’re done… we’re so proud. We price our menus for maximum profitability… and then we forget all about it. We move on. Problem is supplier prices move on too, usually in the direction of a higher price. That menu item that was both culinary genius and financial delight… well, it’s underwater. The truth is that 86% of food sales come from just 16% of the menu items. You don’t want to get those items wrong… or any items for that matter. Everything on the menu needs to be profitable. So, yes, go through the recipe plate costing gauntlet. But when you’re done, don’t bury the details in that stack of invoices on your desk. You need to look at recipe plate costs and menu profitability monthly. If a key ingredient goes up in price… you need to make a move. Change the menu price, negotiate a better deal, find a comparable item. Just don’t lose your shirt. You talk with your supplier rep every week. They’re your lifeline. They’re the key to a more profitable restaurant. They bring you the vital supplies you need to serve your guests. And hopefully, you’ve built great relationships with them. But, they also make money on you. This can make the relationship difficult. It’s important to make sure you address both your relationship and your pricing on a regular basis. It’s a shocking statistic, but 92% of restaurants overpay their suppliers for items they purchase every week. And it’s not just one item, data shows it’s between 5-15 items. Data also shows restaurants regularly pay 86% more… for the same item ingredient from the same supplier, in the same market, in the same week. Follow these 7 steps to make sure you solidify your relationship and keep prices in check. Talk about price trends. What are the top 10 areas of biggest increase? What are the top 10 items of importance to you? We’ve worked with hundreds of restaurants to execute this plan. It never fails. It’s a bulletproof way to save thousands of dollars every quarter. 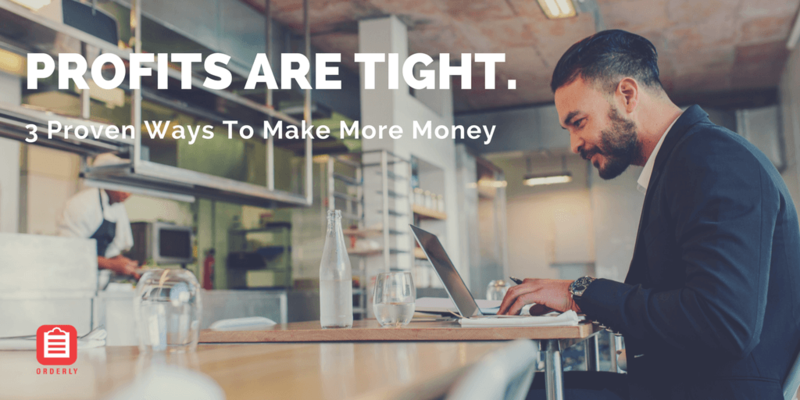 With a good business, you don’t have to change your menu… or remodel the restaurant… or move locations… you just need to take steps to make sure you maximize your profits. Follow this advice and more profits are your destiny for the New Year. Want a hassle-free way to get started? Check out the free Orderly app for food cost management, a supplier price index, and so much more.